Can Evangelicals and Catholics be Friends? ROME, February 28, 2014 (Zenit.org) – Last week Evangelical Anglican Bishop Tony Palmer spoke to a gathering of Pentecostal Christian leaders in America and showed them a personal video greeting from Pope Francis. Bishop Palmer became friends with Pope Francis when he was in Argentina as a missionary ten years ago. Now his friend is the Pope and together they are reaching out in friendship to Evangelical Christians. But can Evangelical Protestants (who are traditionally very anti-Catholic) be friends with the Pope? I was brought up in a strict Evangelical home in the United States. We went to church twice on a Sunday, listened to forty-five minute sermons and had to memorise Bible verses. After high school I went to the fundamentalist college which gave the fiery Northern Irish preacher Ian Paisely his honorary doctorate. By God’s grace I left that extreme religion and moved to England to become an Anglican priest. After serving for ten years as an Anglican minister I and my family became Catholics. I thank God for my solid Evangelical faith and for fifteen years in the Anglican Church. I explain to my friends that I haven’t forsaken those other forms of Christianity. Becoming a Catholic meant accepting more of the Christian faith. All the good things in the other traditions are fulfilled in the Catholic faith. The evangelical faith is incomplete without the Catholic Church, but we are also incomplete without those Christians who are separated from us. The evangelicals have some good traditions we can learn from. Evangelicals tend to be excellent communicators and preachers. We could do with those skills in the Catholic Church. The Evangelicals love the Bible and study it with passion. Our people could do with a better grasp of Scripture. Evangelical churches are strong on fellowship. They really make people feel they belong to a loving community. Some of our parishes could improve in this area. The evangelicals have a strong tradition of sharing the gospel in creative and attractive ways. Sometimes Catholics forget that we are all called to share the good news of Jesus Christ with others. Pope Francis calls us afresh to take part in the New Evangelization and we can learn some lessons from the Evangelicals on how to do this. However, the learning process is not all one way. The new generation of Evangelicals like Tony Palmer are more tolerant and open-minded towards Catholicism. They are less frightened of other forms of worship and are happy to experiment and be open to beliefs and worship practices which would have horrified their parents and grandparents. These “convergent church” Christians are being freed from their old prejudice to explore Benedictine retreats, Ignatian spirituality and Catholic social teaching. Evangelical magazines publish explorations of Catholic styles of worship. I’ve heard of Baptist churches where they have started using candles, celebrate communion every week instead of four times a year and observe the liturgical year. A Methodist minister I know wears vestments for his celebration of Holy Communion, goes to monasteries on retreat and uses the Divine Office for his daily devotions. These promising signs, and many more, have been brought about because Evangelicals and Catholics are finally realising that there is more that unites them than divides. At the heart of the matter both Evangelicals and Catholics believe in a revealed religion, not a relative religion. In other words, we both believe that God has spoken and that settles it. The core of the faith has been given by God. It was not made up by people. It was not simply the result of social conditions and the quirks of human history. This fundamental attitude about the faith means we have a gospel to proclaim and a faith to live, and this is in contrast to the wishy washy grey Christians who water down the faith to a beautiful hobby or a system of good manners. There is plenty of scope for Evangelicals and Catholics to work and worship together. But we have to remember there are also big differences between us. Evangelicals do tend to minimise the faith. They want to cut out lots of things we Catholics believe are essential. There is still a large amount of distrust and misunderstanding between Evangelicals and Catholics. One of the biggest obstacles to unity is the fact that most Evangelicals don’t see the need for it. They believe individual churches and denominations are all man made, and that you just choose the one that suits you best. Formal union may still be a long way from us, but in the meantime the warmth of affection Pope Francis extended to the Protestants in Texas should be an example to all Catholics. Popular writer Fr Dwight Longenecker is a former Evangelical, then an Anglican priest. Read his latest book, The Romance of Religion. Visit his blog, browse his books, listen to his radio show and be in touch at dwightlongenecker.com. Thousands of people, dozens of airplanes, and just a few short weeks. Now begins the most vigorous speaking season of my year. Will I be in a city near you? 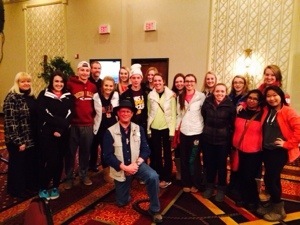 After my recent talk in Fargo (frigid cold Fargo) I was surrounded by what they called “Steve Ray’s Fan Club.” They’ve been watching my DVDs at school and wanted to meet me in person. What great people they were!